Congressional reaction to the summary of special counsel Robert Mueller's findings Sunday unsurprisingly split along party lines as Republicans saw complete vindication and exoneration of President Donald Trump, while Democrats felt frustrated and demanded the full report and supporting documentation be sent to Capitol Hill, where investigations into the President continue. Democrats also complained about the role Attorney General William Barr played in deciding not to prosecute Trump over allegations of obstruction of justice, especially after Mueller wrote, "While this report does not conclude that the President committed a crime, it also does not exonerate him." The Democratic chairman of the House Judiciary Committee, Rep. Jerry Nadler of New York, who is leading one of the several ongoing investigations into Trump, said he would soon call on Barr to testify before his committee to explain his actions. "Special Counsel Mueller worked for 22 months to determine the extent to which President Trump obstructed justice. Attorney General Barr took 2 days to tell the American people that while the President is not exonerated, there will be no action by DOJ," Nadler said in one of a series of rapid-fire tweets he sent in the minutes after Barr sent a letter to the Hill outlining Mueller's report. 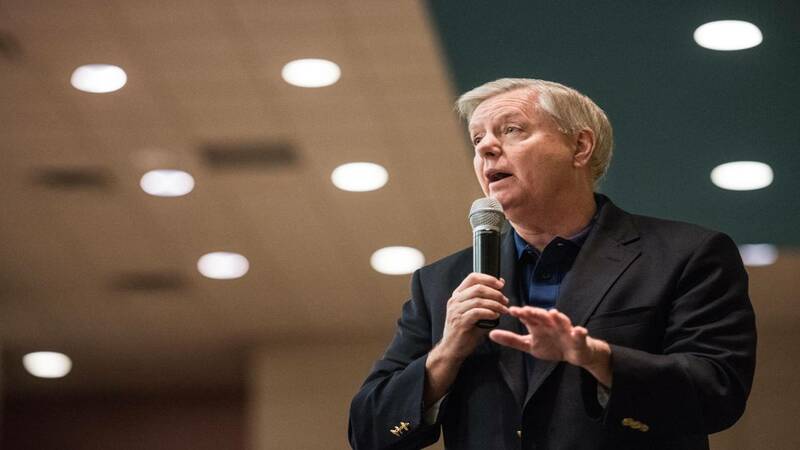 As he prepared to board Air Force One with Trump in Florida to fly back to Washington, a cheerful Senate Judiciary Committee Chairman Lindsey Graham applauded the long-sought findings. "Great day for President Trump and his team. No collusion and no obstruction. The cloud hanging over President Trump has been removed by this report," the South Carolina Republican said. House Minority Leader Kevin McCarthy, a Republican from California, declared "the case is closed." "Our country welcomes this long-overdue conclusion. After two years, two congressional investigations, and now the closure of a Special Counsel investigation with unfettered authority to investigate 'any links or coordination between the Russian government and individuals associated with the Campaign of President Donald Trump,' it is abundantly clear, without a shadow of a doubt, there was no collusion," he declared. House Republican Whip Steve Scalise said the allegations against Trump were concocted by Democrats and the media. "Democrats and their allies in the media have chosen to spend the last 674 days perpetuating conspiracy theories and lies in a shameless effort to discredit a President whose election they still are trying to overturn," said the Louisiana congressman. In a joint statement, House Speaker Nancy Pelosi, a Democrat of California, and Senate Minority Leader Chuck Schumer, a Democrat from New York, said the letter from Barr "raises as many questions as it answers." "The fact that Special Counsel Mueller's report does not exonerate the president on a charge as serious as obstruction of justice demonstrates how urgent it is that the full report and underlying documentation be made public without any further delay. Given Mr. Barr's public record of bias against the Special Counsel's inquiry, he is not a neutral observer and is not in a position to make objective determinations about the report," they wrote. Sen. Richard Blumenthal, a Democrat from Connecticut, has been one of the most outspoken critics of Trump since the investigation into allegations of Russian collusion and obstruction of justice were raised. He accused Barr of siding with the man who appointed him when deciding how to handle the obstruction consideration. "According to the Attorney General, the Special Counsel concluded that the evidence fell short of a prosecutable criminal conspiracy, which involves a high bar of proof beyond a reasonable doubt -- but reached no such conclusion on the obstruction of justice issue. On obstruction of justice, the Special Counsel tossed a jump ball, and the Attorney General tipped it to President Trump, but shared none of the information supporting his conclusion," Blumenthal said in a statement. One Republican who appeared pleased but stopped short of gloating was Senate Majority Leader Mitch McConnell. He put the focus back on Russia, which Mueller found interfered with the 2016 campaign even if Trump's campaign wasn't involved. "The Special Counsel's conclusions confirm the President's account that there was no effort by his campaign to conspire or coordinate with Russia in its efforts to influence the 2016 presidential election," McConnell said in a statement. "However, Russia's ongoing efforts to interfere with our democracy are dangerous and disturbing, and I welcome the Special Counsel's contributions to our efforts to understand better Russia's activities in this regard. And I look forward to the continuing work of the Senate Select Committee on Intelligence on the threats posed to our democratic institutions by foreign interference." While the intelligence committee's investigation continues, its chairman, Sen. Richard Burr, a Republican from North Carolina, has said for months that their long probe into Russian interference has not found any evidence of collusion between the Russians and Trump officials.